Named after its first known owner, the Count Cesare di Castelbarco, a notable mid-19th century Milanese collector and enthusiast, this violin is a fine golden-period Stradivari in origin, with several significant although high-quality replacements. The original broad-flamed one-piece back is unmistakably by Antonio Stradivari at the height of his powers. 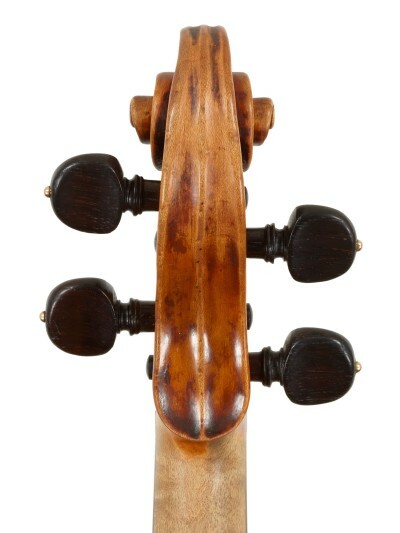 We see similar wood used in the “Emiliani” violin of 1703, the “Marsick” of 1705 and the “Joest” also of 1705. The arching of the back is bold and confident; the edgework and purfling are refined and fluid; the original varnish is abundant in the fluting of the C-bouts and is deep orange-red over a typical Stradivari golden ground. 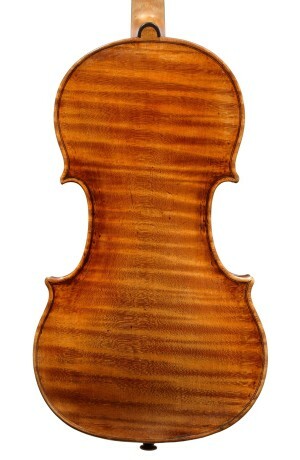 The origin of the top, ribs and head of this violin is the source of some speculation. The top was almost certainly made in France in the early part of the 19th century and has been variously attributed to both Nicolas Lupot and Jean Baptiste Vuillaume, although contemporary expertise suggests it is more likely the work of the former. The replacement may have been necessitated by an accident or it may be the result of the clever assembly of various components, an ignoble practice which was unfortunately far too common in the early 19th century. Interestingly, the later parts are not mentioned by either David Laurie or Nicolas François Vuillaume in any of the letters and receipts accompanying the sale of the violin in 1875. But of course it is possible that neither recognized these parts as replacements and the omission was accidental, or the issue may have been addressed elsewhere but not in the surviving documents. The ribs and the finely carved head of the violin are of attractive maple and appear to be 18th-century Italian in origin, but appear not to belong to either the top or the back. The lower rib was originally made in two pieces, which rules out most classical Cremonese work, and the miter-joints are more pinched and less compact than Stradivari ribs of the period. The ears of the head have been altered and recut to appear more Strad-like in profile, which has obscured what might have been usable clues as to its maker. It is possible that the ribs and scroll belong together, as the maple used for the ribs is almost identical to that of the head, and both are plainer, with a more irregular flame than that of the back. It has been suggested that they are the work of Matteo Gofriller, although a conclusive attribution is elusive. An interesting series of documents relating to the violin date from the spring of 1875. 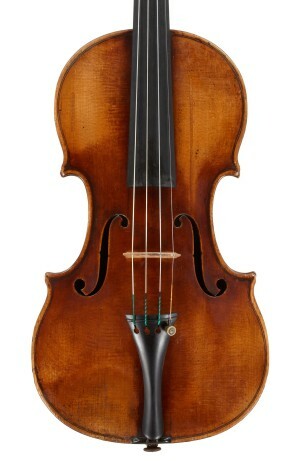 Beginning on April 28 of that year, Nicolas François Vuillaume of Brussels, the brother of Jean Baptiste, “sold and delivered” the violin to Mr David Laurie of Glasgow. In the accompanying certificate of the same date, N.F. Vuillaume describes Count Castelbarco’s frequent use of the violin during “quartet parties”, occasions upon which he no doubt had his choice of instruments. Laurie was quick to find a new owner for the violin after acquiring it himself. A deal was soon arranged for Mr Robert Butter Malcolm, also of Glasgow, to exchange Mr Malcolm’s 1706 Stradivarius violin and the sum of £25 for the Castelbarco violin. The original receipt from Laurie to Malcolm is preserved in which he warrants the Castelbarco violin to be “entirely genuine in each and every part”.